Back in 1987, the eyes of the sailing world were on Fremantle in Western Australia for the America’s Cup. Now almost 30 years on, Fremantle once again hosts some of the greatest match racers of the modern era, with the 2016 World Match Racing Tour season about to commence on Wednesday. Just as Dennis Conner and Stars & Stripes wrenched back the Cup from Australia on the turbulent waters of the Indian Ocean, Taylor Canfield and his Team US One are hoping they can exert their early advantage in a new season of the Tour, having lost out to Ian Williams and GAC Pindar in last season’s finale a little over a month ago. Even Canfield could not deny that the British skipper was the master of the keelboat era of the Tour, his January victory at the Monsoon Cup in Malaysia bringing Williams a record sixth world title. The US Virgin Islands sailor, more than 10 years Williams’ junior, burst on to the Tour to win the world title from his arch-rival in his first full season on the circuit back in 2013, but has struggled to match Williams since. 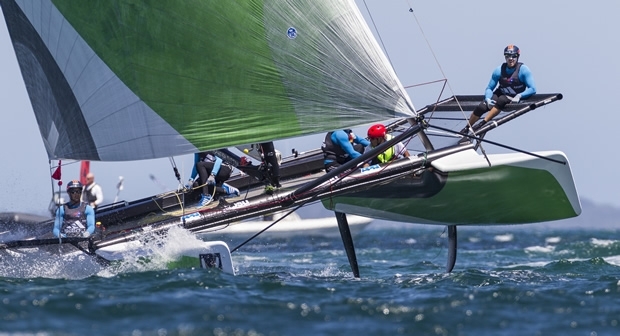 Now with the switch from the slower keelboats to high-performance M32 catamarans for future editions of the Tour, Canfield once again fancies his chances at winning another world title. TeamUS One have the benefit of more than a season competing in M32 fleet racing circuits both in the USA and Scandinavia. With that experience Canfield’s crack crew go into Fremantle as the clear favourites. However other teams have been working hard to close the experience gap, not least Williams who has been putting in the hours in Bermuda over the past few weeks since his Monsoon Cup victory. GAC Pindar pushed US One hard at the second event of the M32 Series Bermuda, and was the top-performing team on the final day of light winds. “It was great to win that second day,” said Williams. There are other teams who will be relishing the switch to fast multihulls, such as those with experience of the Extreme Sailing Series. Amongst these are Tour Card holders Phil Robertson, the New Zealander and a long-time Tour participant, and Yann Guichard from France. The Frenchman may be a Tour virgin and without the strong match racing background of other crews, but there isn’t much anyone can tell Guichard about sailing at high speed. The skipper of Spindrift Racing has competed in Extreme 40s, AC45s and foiling GC32s. This past winter he skippered the 40m giant trimaran Spindrift 2 on a 47-day circumnavigation of the globe, coming tantalisingly close to breaking the record for fastest around the world. Their M32 experience will stand two Swedish skippers in good stead, Tour Card holder Mattias Rahm and Wild Card invitee, Hans Wallen, an Olympic silver medallist in the Star keelboat. There is also strong Australian talent competing in Fremantle including young Western Australian sailors such as former 29er World Champion Steve Thomas and 49er campaigner Sam Gilmour. The six-day regatta in Fremantle, taking place off the famous Bather’s Beach, is the first of five World Championship Events across three continents - Australasia, Europe and America, all leading up to the finale of this so-called ‘short season’ which culminates with the World Championship in Marstrand this July. With 20 teams competing in Fremantle, the first two days of the regatta are fleet racing, which sees the 20 split up into four groups of five boats, and each group scheduled to complete four or five back-to-back races each day. Then the second phase of the regatta moves into a knock-out match racing contest more in line with the typical elimination format of the World Match Racing Tour. With the racing taking place close to shore, and each race lasting an average of 12-14 minutes, the competition will be fast and furious, and perfect for spectators and VIP corporate guests to enjoy all the action.